These Dominoes Sets feature Tournament Size Double 6 Dominoes (2" x 1" x 1/4") with Spinners. 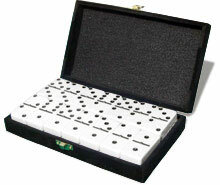 Each Domino set comes in a black velveteen storage box along with instructions on game play. The box features a padded inner lid to protect your tiles, as well as brass-colored hinges and matching clasp. 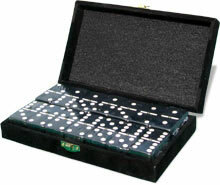 Domino Sets are available with Black, Red, and White tiles. 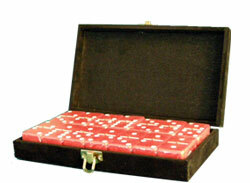 Feel free to browse our many other Game Products including our popular Pokeno Sets,Backgammon Sets, and Card Games. Got a question about our Tournament Dominoes? You can Contact Us by calling 1-800-233-0828 to speak with a customer service representative.